Rogers' cable Internet subscribers in Canada below the low-income belt can now avail fast Internet connections at a reasonable price. "Connected for Success," the program's name, was previously started back in 2013 in the Toronto Community Housing district and had received "tremendous" success during its initial stages, according to Chief Customer Officer of Rogers Communications, Deepak Khandelwal. He believes that the Internet isn't just a "nice to have" but a necessity in the current era wherein kids would connect to the Internet after school or seniors catch up with peers through the Web among other services they can access, like banking and government services. The last time Canada's telecom regulator launched a review of "basic telecommunications services," one of its decisions focused on the necessity of the phone book. Now, five years later, hopes are high that its next review opens a new chapter. In 2011, the Canadian Radio-television and Telecommunications Commission (CRTC) didn't include high-speed Internet in its definition of "basic telecom services." That could change this time around as the regulator considers more ambitious goals in an age where people are spending more of their lives online streaming video and music, using social media and other apps, and experimenting with "Internet of things" connected devices in their homes. Canadians' right to fast, reliable Internet, its role in the economy and the social isolation of not being online are all up for discussion. Ottawa anti-poverty advocates say Rogers Communications Inc. should go beyond offering basic internet services to people in non-profit housing and instead expand the service to all people living in poverty. On Thursday Rogers said it was expanding a program it already offers in Toronto to tenants in non-profit housing developments across the country, granting them basic internet access in their home for $9.99 a month. Rogers said 1,100 residents in rental units owned by three non-profit housing groups in Ottawa, including the Centretown Citizens Corporation, will get discounted internet to start. Internet for All: We are getting closer! Since the launch of our Internet for All campaign at our 2013 National Convention, we have been continually working hard to get affordable internet rates for low-income Canadians. We’ve had some success - Rogers has started providing $10 a month internet for residents in Toronto Community Housing, and federal regulators are now in the process of conducting a review looking at high-speed internet, affordability and access. And we need to keep the pressure on! Our tireless efforts to make Internet for All Canadians a reality have ensured that 10 of our members will be presenting at CRTC’s public hearing on April 14 to explain why broadband internet should be affordable for Canadians. Their testimony will draw from personal experiences, letting these decision makers know how vital yet unaffordable home internet is. 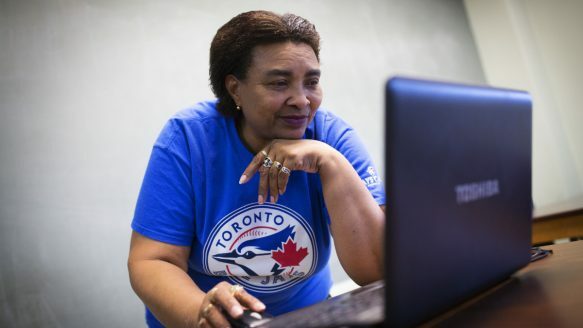 Low-cost Internet service for tenants in Toronto public housing is being expanded to social housing communities across Ontario, New Brunswick and Newfoundland, the Star has learned. The $9.99-a-month program offered by Rogers Communications, will be available to more than 150,000 low-income households everywhere the company provides Internet services starting this month. The telecommunications giant is making the announcement at a non-profit housing building in Ottawa Thursday.